Herihor's Court in the Temple of Khonsu features a scene with Herihor "presenting the House to its Lord" - Khonsu, in the presence of Hathor. 5Hathor, residing in Benbene, the Noble Lady 6who is in Thebes, Lady of Heaven, as she gives all life, stability, and dominion like Ra,7"I have given you all health on my part." Footnote, page 18 (46 in the pdf)" "On Benbene as a designation of the Temple of Khonsu or its site, see Kurt Sethe, Amun und die acht Urgotter von Hermopolis"
During the second half of Ramesses XI reign, High Priest of Amun Herihor ruled over the south from Thebes, limiting this Ramesses' power to Lower (Northern) Egypt. This was just before the end of the New Kingdom. 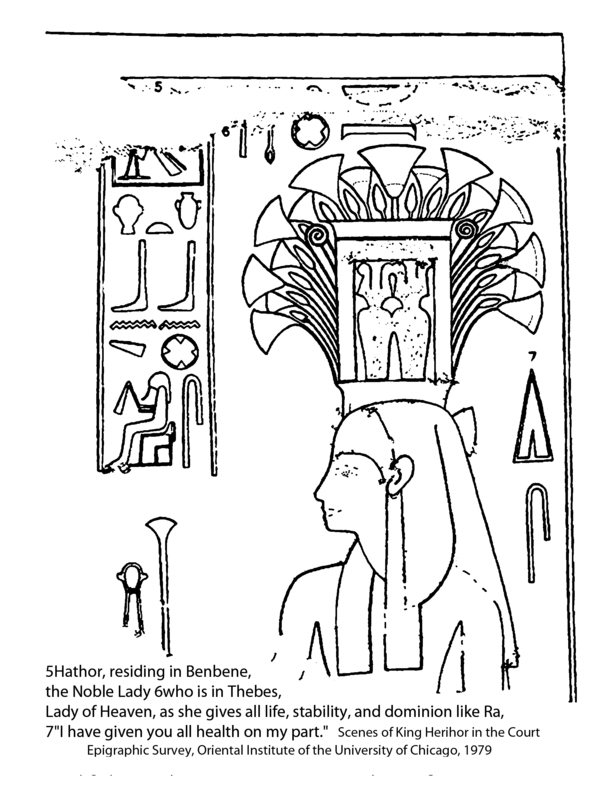 To me, this crown suggests Hathor as enabling lush growth. I wonder if this crown is a "one-of", or are there others? I looked in Dr. Richter's The Theology of Hathor of Dendera, and it isn't one of the many varieties of crowns in the Dendera Per Wer. For instance, the "peristyle court and hypostyle hall of Luxor Temple present a veritable grove of papyrus bundle columns symbolic of the primeval marsh from which creation unfolded". (From _The Complete Temples of Ancient Egypt_, by Richard H. Wilkinson (Thames and Hudson, 2000), page 78) They understood the temple as "the domain of the god as a created world in microcosm" (Ibid, page 76). February 21, 2018 Thoughts... Why is Hathor present while Herihor is presenting this Temple of Khonsu to Khonsu? Why does she reside within this temple? Because the "green and flourishing" aspects within the temple come from Hathor! Hence, her presence is necessary.